LINES, VINES, AND JONAS TIMES: REMAINING US & CANADA JB TOUR DATES ON SALE TOMORROW !! REMAINING US & CANADA JB TOUR DATES ON SALE TOMORROW !! WORLD TOUR - REMAINING US AND CANADIAN DATES GO ON SALE TOMORROW!!! Just a reminder to everyone that the rest of our US and CANADIAN World Tour dates go on sale this week. TEAM JONAS - our official Fan Club - will have the first opportunity to pre-purchase tickets for our Fan Club pre sale starting TOMORROW morning (MONDAY). 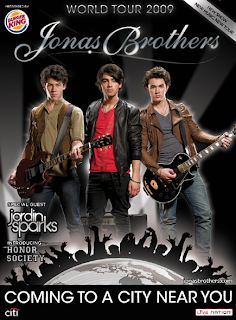 If you are not a part of TEAM JONAS you will want to join to get the best opportunity to get tickets. SATURDAY of this week (MARCH 28th) will be the public on sale of the US and CANADIAN tour dates. Please check out the profile page to see the entire listing. Hope you are able to get tickets and we hope to see you on the WORLD TOUR THIS SUMMER!